Home / Phcog J, Vol 9, Issue 6, Nov-Dec, 2017 / Phenolic Constituents, Anti-Inflammatory and Antidiabetic Activities of Cyperus laevigatus L.
Phenolic Constituents, Anti-Inflammatory and Antidiabetic Activities of Cyperus laevigatus L.
1Natural Compounds Chemistry Department, National Research Centre, 33 El Bohouth st., Dokki, Giza, 12622, EGYPT. 2Department of Pharmacognosy, Faculty of Pharmacy, Ain-Shams University, Cairo, EGYPT. 3Medical Biochemistry Department, National Research Centre, 33 El Bohouth st., Dokki, Giza, 12622, EGYPT. 4Department of Pathology, National Research Centre, 33 El Bohouth st., Dokki, Giza, P.O. Box 12622, EGYPT. 5Faculty of Pharmaceutical Sciences, Tokushima Bunri University, Yamashiro-cho, Tokushima 770-8514, JAPAN. Background: Cyperus species are well known traditional plants and used for several diseases around the world. Aim of the Study: Our study aimed to identification of the phenolic constituents in addition to evaluation of different extracts of Cyperus laevigatus L as antioxidant, antiinflammatory and antidiabetic agents. Materials and Methods: The phenolic constituents were identified using spectroscopic techniques. The antioxidant activity was evaluated using in vitro DPPH assay. Total extract, methanol and EtOAc fractions were evaluated for their antiinflammatory activity using RAW 264.7 macrophages assay. Antidiabetic activity of the total extract was examined biochemically and histopathologically using streptozotocin-induced diabetic rats. Results: A new flavone, chrysoeriol 7-O-β-(6‴-O-acetyl-β-D-glucopyranosyl)-(1→4) glucopyranoside (1), along with seven knowns (2-8) were isolated from Cyperus laevigatus L. The structures of isolated compounds were established depending upon 1D, 2D-NMR and HR-ESI-MS. The MeOH and EtOAc fractions exhibited significant antioxidant activity while the isolated flavonoids exhibited from moderate to weak antioxidant activity. The total extract, MeOH and EtOAc fractions exhibited significant anti-inflammatory activity using LPS-stimulated RAW 264.7 macrophages model by decreasing of NO accumulation by 76 – 66% and 84 – 67%, of the original accumulation values with increasing concentrations in comparison with the reference drug, dexamethasone. The total extract exhibited antidiabetic activity in streptozotocin-induced diabetic rats and this effect was manifested by decreasing serum levels of glucose, glucagon and NO. It also increased level of insulin and promoted paraoxonase activity. Conclusion: These results proved that this plant may be multiple sources for medicinal natural drugs especially for anti-inflammatory and antidiabetic. 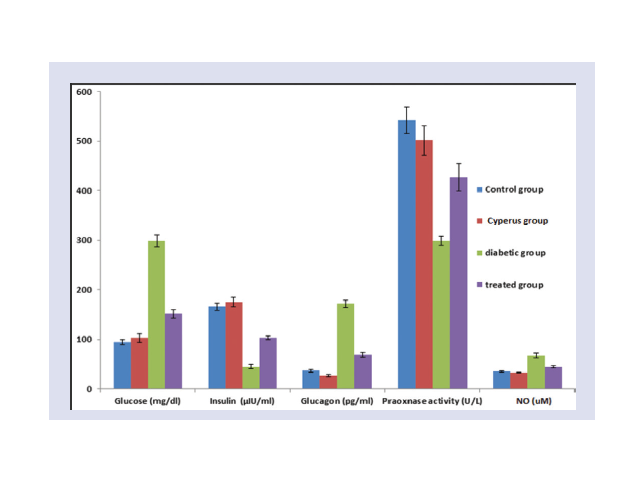 Mean serum glucose, glucagon and NO levels were significantly high and serum insulin and serum praoxnase activity level were significantly low in diabetic group compared to normal group. Elshamy AI, El-Shazly M, Yassine YM, El-Bana MA, Farrag A-, Nassar MI, et al. Phenolic Constituents, Anti-Inflammatory and Antidiabetic Activities of Cyperus laevigatus L. Pharmacognosy Journal. 2017;9(6):828-833.